What do these household items have in common? How can they help your child develop concepts about math? 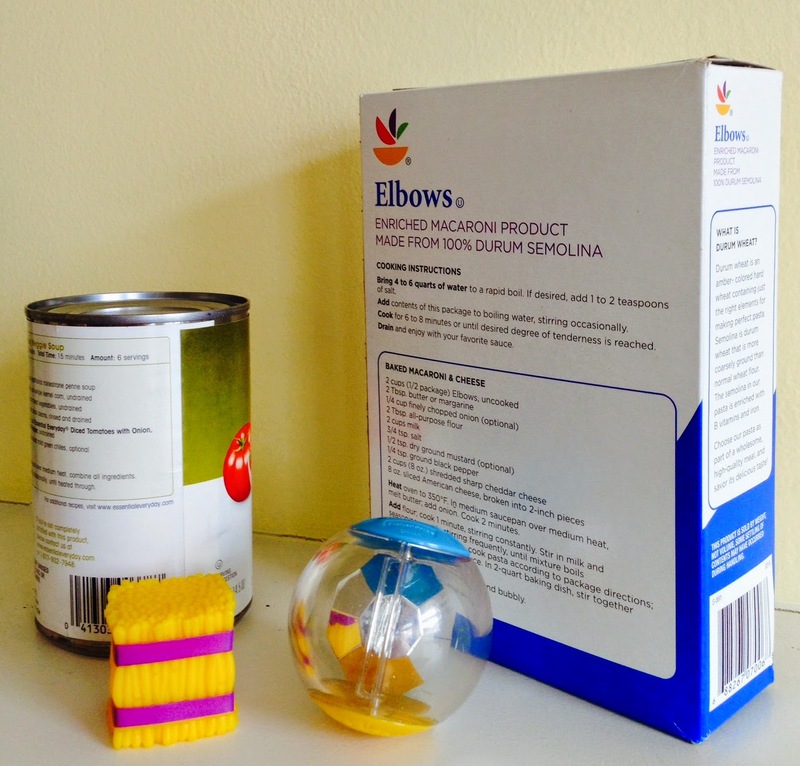 These simple objects give children a hands-on experience with geometry. We often teach about shapes like circles, squares, rectangles, and squares. Children see them on television shows and use them in art projects. See our post Blast Off to Math Readiness for one idea. But these are 2 dimensional shapes. It is important for children to have early hands-on guided experience with 3 dimensional shapes, too. Give children a ball. Ask them what they notice about the ball. They may begin by talking about color but will eventually discuss shape. You can ask questions like, "How is the ball different than a circle?" or "What other objects are like this?" "Can you think of food that is like this?" You can tell them that this is called a sphere. Ask children to discuss the ways a circle and sphere are alike and ways they are different. Show children other objects like a can of food. After they handle this and describe it, share the mathematical term, cylinder. Have them find other examples of cylinders. They can draw these items or just tell about these real-life examples of geometry. Continue on with using the word, cube, for the toy shown in the photo. You may have dice, blocks, etc. that you can encourage children to touch and then describe. Have them compare cubes to squares. If children have an understanding of the term rectangle, you can show them a box, as pictured above. This 3D item is a rectangular prism. Children should be encouraged to describe it and find other examples. Throughout this discovery time, children can be encouraged to use words like edges and faces. They may notice that one of the faces on a rectangular prism looks like a rectangle. The same can be done for other shapes such as square for cube or even circle for the end of a cylinder. Some children will be able to verbalize more about these 3D shapes than other children. Everyone is at a different stage. The key is that all children have the opportunity to touch and talk about 3D objects! NAEYC: 2.D.03; 2.D.06; 2.F.03; 2.F.06. This morning Ian woke up and looked out his window. The birds were chirping and the ground looked clean. Ian stopped to think about this. Who made sure the birds had a good place to live? Who made sure the street was clean? Ian and his dad walked to a city bus stop to ride to school. As Ian and his dad got on the bus, they said, “Good morning,” to the driver. She smiled at them. Ian watched the people walking on the sidewalk. He saw some people riding bikes. They were on a special bike path, built just for them. Ian especially liked passing by the community garden. Mrs. Bertrand was standing at the gate, giving people tools to help them care for their plants. Suddenly Ian saw a fire truck. It was not making a sound but was headed to the park. . He saw many people standing around a tree. A cat was stuck in the high branches. Ian’s dad explained that the firefighters would get out their ladder and help the cat get down. When the bus stopped in front of Ian’s school, he and his dad waved to the driver. They said hello to the high school students who were picking up trash that had blown onto the playground. Ian took his dad’s hand as they walked into the classroom. He wanted to show him the thank you letter he and his friends made for the shopkeeper who had given the class birdseed for their window birdfeeders. Then Ian was ready to start his day! After reading this little story (and we hope you will change names, events, etc. to make it more relevant for your area), ask children to retell it to encourage sequential thinking. You can hold up fingers to represent the events. This visual helps children think about the order of Ian’s morning. Do you think someone who walks helps the community by not using gas? This keeps the air cleaner. Do you think someone who drives a bus helps the community? This offers people a chance to ride together and keeps more cars off the roads. Would people who made a bike path be community helpers? Tell why. Do you think someone who works at a garden helps the community? Explain. Were you surprised that firefighters help animals, too? How are the high school students helping the community? Do you think the shopkeeper is a community helper? Why? Do you think Ian is a community helper? Tell why. This little story gives our children a window into those that might not readily be thought of as community helpers. It shows that everyone, even preschoolers like Ian, can make a difference in the world. As a follow-up, make a list of those who help around your school and neighborhood. As you know, anytime we make charts and lists, we are modeling literacy concepts for our children. *It is important and necessary to tell children to picture a story. I always suggest ‘making’ a movie of it in their minds. Throughout the years many children have told me they did not know they were allowed or supposed to do this! NAEYC – 2.D.01. ; 2.D.03. ; 2.D.06. ; 2.E.03. Head Start – V.A. ; V.B.;VII.D. ; VIII.A. ; IX.C.;XI.B. 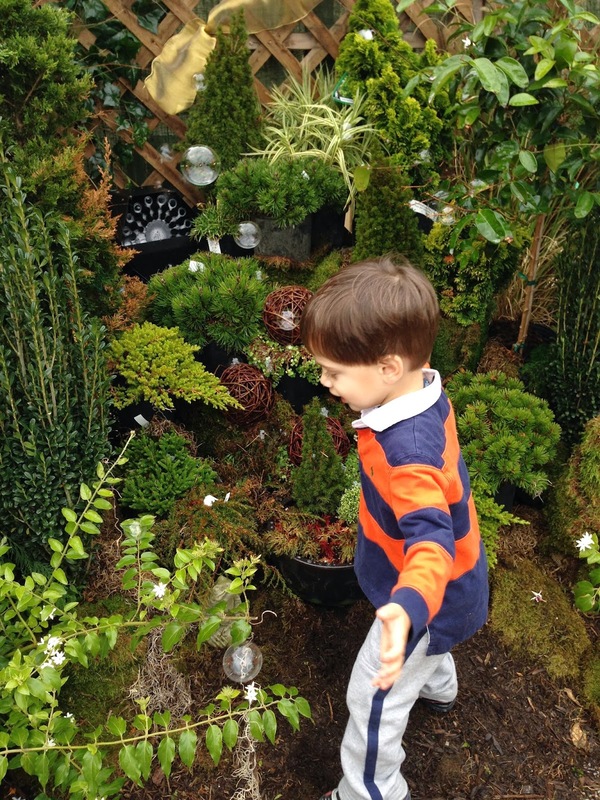 Help your children to look around your town, city, and even neighborhood this Earth Day and see the wonders of the area in which they live. We like to begin by encouraging children to talk about what they like in your locale. Some children may begin naming stores or restaurants but likely someone will mention a park, body of water, or even an animal recently seen. We like to accept all responses but dramatically congratulate those who begin talking about nature. Saying, “You really have the spirit of Earth Day because you are seeing nature,” will help others to begin thinking about and noticing the beauty of your area. Children may name big areas like lakes, ponds, forests, or nearby mountains. Other children may think about small areas of beauty such as the petals on a blossoming flower. We suggest providing children with a large sheet of paper, even some from a bulletin board roll or freezer paper to draw a mural of their favorite local natural sights. Ask children to talk about their drawings, after which you can label them. This helps with sound/symbol relationships and even sight word development. 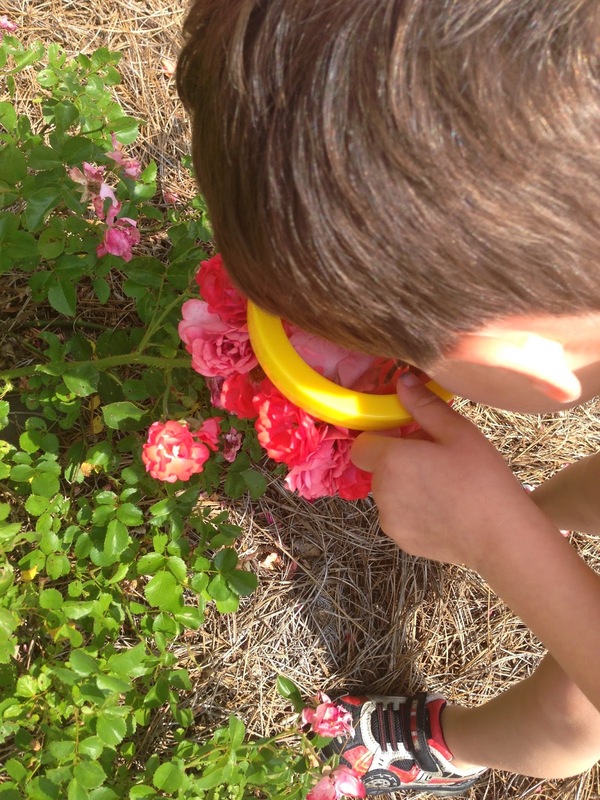 Make it a part of your morning routine to talk about something special children have noticed in nature. Asking children to describe local natural areas of interest to them, helps develop an appreciation for Mother Earth, especially when they know you value this type of discussion. And who knows….your eyes may even be opened to a spot, tree, or flower that you had previously taken for granted! NAEYC – 2.D.03. ; 2.D.04. ; 2.D.06. ; 2.G.03. Head Start – V.B. ; VIII.A. & B.; XI.B. Layers of the Earth Song! The ABCs, Days of the Week, Months of the Year - these are examples of ways music helps young children learn. You can make up a song about anything by using easy tunes. This week our activity (available to you FREE when you sign up in the box to the right) focuses on layers of the earth. Here's a fun way to get children excited about this science concept. Sing it to the tune of "The Adams Family." Layers of the earth, layers of the earth, layers of the earth, layers of the earth. The earth it has 3 layers – 3 layers all around. The core is at the center. It’s way deep underground. Above it is the mantle; it can get quite hot. It’s filled with miles of magma and lots of igneous rocks. The part that we can walk on, it is called the crust. It has rocks and mountains and even blowing dust. 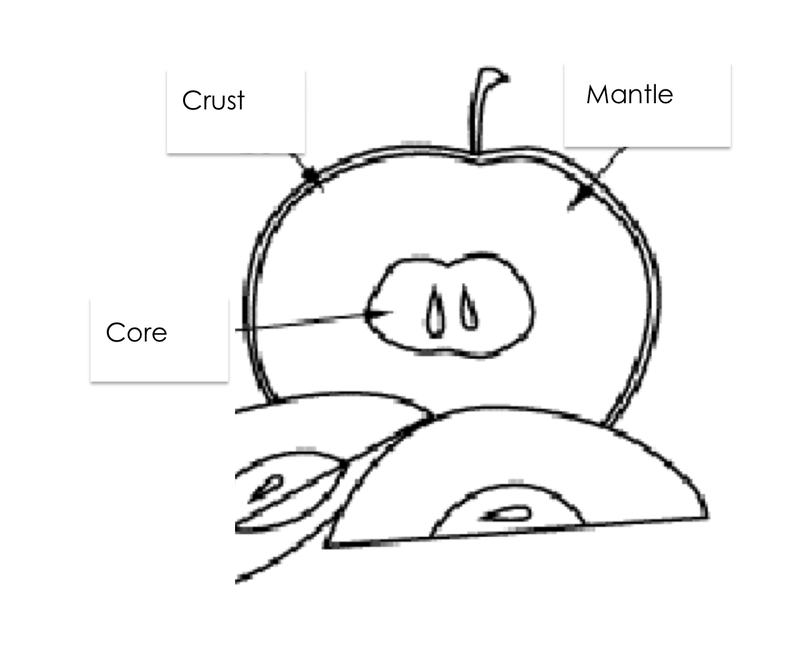 Our Earth it has three layers – the core, mantle, and crust. You can see I know them – so I’m a scientist! Remember, when we encourage children to cross the center line (right hand to left side or left hand to right side) we are waking up brains. It's a great way to start the day! NAYEC: 2.G.02. ; 2.G.07. ; 2.G.08. ; 2.J.